Duo-kleener stand; alternative & steel spike brush styles available. Put this useful spike cleaner to work wherever it's needed most. Anchors in asphalt or in the ground with turf stakes. 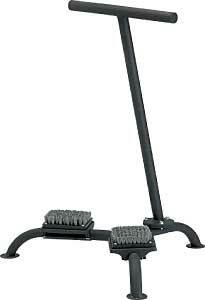 Includes stand, brushes, hardware and three 3 1/2" spikes. Alternative Spike Brush style.